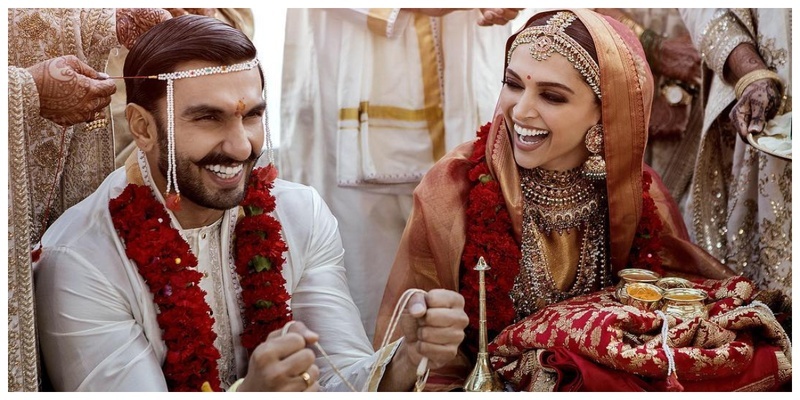 And the wait is finally over, Deepika Padukone and Ranveer Singh have finally released the official pictures and I literally can’t get over how amazing they look. The duo tied the knot yesterday in a Konkani wedding, tied the knot again in a Sindhi wedding ceremony today and it’s literally melting my heart and HOW. Deepika is looking stunning a gold Sabyasachi saree while Ranveer is looking his dapper self in a while and gold sabyasachi outfit! Deepika has completed the look with a statement matthapatti and traditional South Indian jewelry. For the Sindhi Wedding she chose to wear a red and pink lehenga while Ranveer is looking dapper in red and golden sherwani! Ranveer and his baraat arrived in boats, dancing to all the 90’s Bollywood numbers and the choice of songs was all Ranveer! According to India Today, 90s songs like 'My Name Is Lakhan', 'My Name Is Lakhan, Chunnari Chunnari and Tamma Tamma’ were on the playlist today as the baraat reached the Villa del Balbianello! The Bajirao Mastani is said to have danced on Govinda's song hiding behind the umbrella as he led his baarat. The wedding venue and mandap for the Sindhi wedding was decorated with the thousands of red roses. Well well while all these details are too cute to handle, I too can’t wait for the official pictures to be released soon!